Set a beautiful table with Mara Stoneware that offers durable stoneware in unique designs for your dining pleasure. Whether you are looking for stoneware dinnerware, a stoneware dish, stoneware pottery, plates, bowls, coffee mugs, dinner plates, or a decanter it's all here at discounted prices. Sweeten up your table decor with these hand crafted creamer and sugar stoneware sets by Mara. These durable stoneware sets are suitable for both the microwave and dishwasher and are sure to last for years while keeping its original beauty. 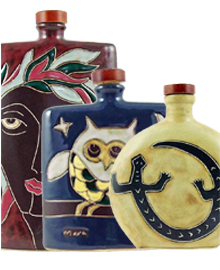 Handcrafted using only lead and cadmium free glazes, these stoneware decanters by Mara are the perfect gift for fathers, college graduates and collectors. Available in 4 sizes; 20 oz., 24 oz., 28 oz. and 44 oz. Pretty enough to put on display but durable enough to use for everyday dinnerware. These stoneware dinner plates by Mara are handcrafted from cadmium and lead free glazes and are microwave, oven and dishwasher safe. 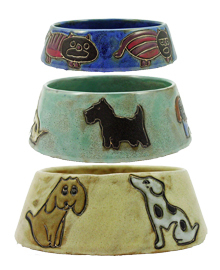 Mara Stoneware has created wonderful handmade pet accessories perfect for your pampered pooch or furry feline. These stoneware cat and dog bowls are perfect for all your beloved best friends. 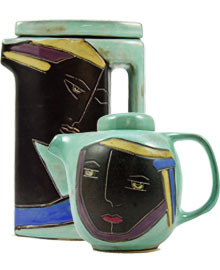 Vibrant colors and unique handcrafted designs adorn these collectible stoneware pitchers. Available in 2 convenient sizes and 3 unique shapes. Choose from a 32 oz. scoop neck pitcher, a 32 oz. curved pitcher or a traditional 44 oz. water pitcher. In round and square styles, these unique stone mugs by Mara offer a raised look to the decorative pattern adorning it. 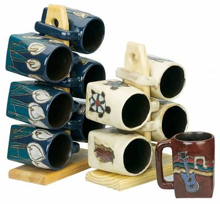 These beautiful handcrafted stoneware mugs are perfect for coffee on the go or for sipping hot chocolate with your favorite blanket on a cold day. Let one of these Round Stoneware Mugs become your favorite mug. 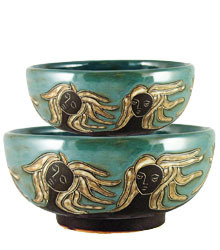 Beautiful hand finished stoneware serving bowls in two convienient sizes to give your dinnerware that special look. Use the 72 oz. serving bowl for pasta and salads. Use the 24 oz. serving bowl for soup, cereal and dessert. These works of art are the perfect compliment to your table. 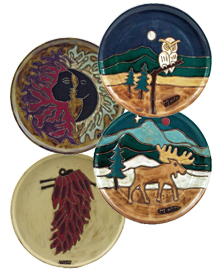 Mara presents beautiful hand crafted stoneware mug and saucer sets. 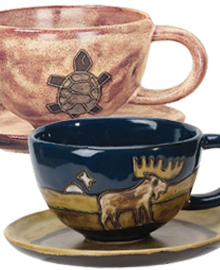 These microwave, oven and dishwasher safe stoneware cup and saucer sets are perfect for your favorite soup or beverage. Unique and colorful this square stoneware dinnerware by Mara is a great way to get your kids to eat a square meal. Whether you want a full 16 piece set of 1 color or individual pieces to mix and match, this is a great addition to your kitchens arsenal of beautiful dinnerware. 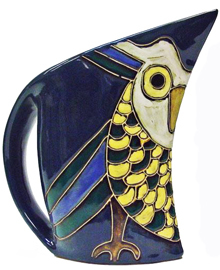 Unique hand finished square mugs in beautiful designs and colors made by Mara are offered. These 12oz square bottom mug sets are perfect for coffee, tea, hot chocolate or soup for yourself or as a gift. 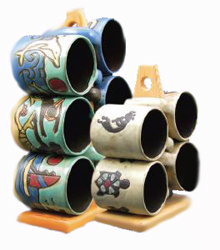 These handcrafted stoneware steins by Mara are perfect for your favorite brew or beverage. 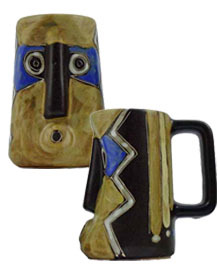 Whether you choose a one-of-a-kind 15oz sculpted stein or a brilliantly colored 16oz stein both sizes are perfect for both hot and cold liquids. 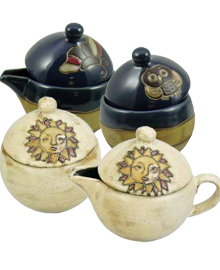 These stunning handcrafted tea pots are perfect for an afternoon tea by yourself or for hosting an entire tea party. 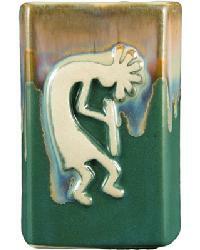 The unique designs and bold colors are sure to become a favorite for you and your guests. 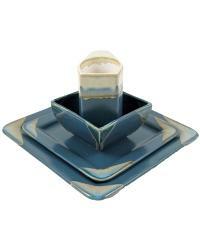 Set a beautiful table with our stoneware. Whether you are looking for stoneware dinnerware, a stoneware dish, stoneware pottery, plates, bowls, coffee mugs, dinner plates, or a decanter we have it all at discount prices.